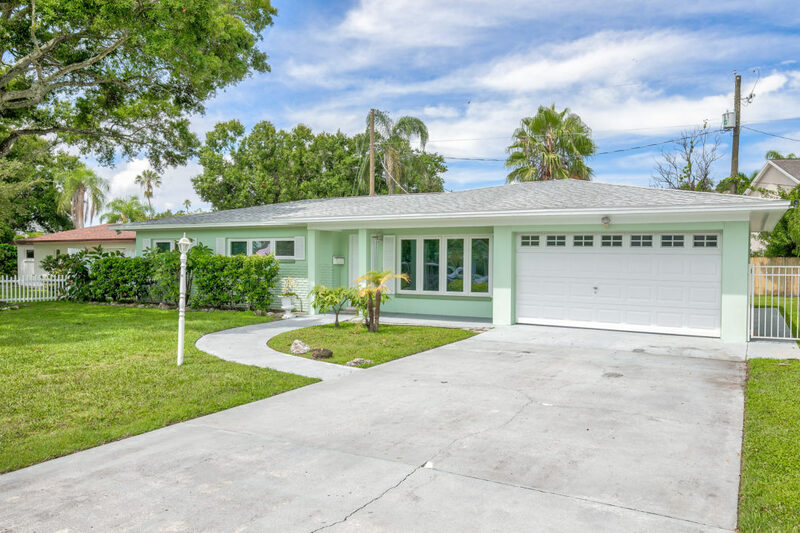 Rare opportunity to own a meticulously maintained classic ranch style home on the waterfront community of Davis Islands. This home is tucked away in the beautiful back streets of Davis Islands and sits on a wide 80 ft lot. As you pull into the driveway, you will notice the WIDE two car garage, inviting front porch and a spacious yard that is perfect for playing a game of catch. As you enter the front door you will immediately notice the gleaming terrazzo floors that spread throughout the entire home. Additionally, each room has wonderful newer energy efficient windows that bring in great light to create a real coastal feel. The vintage kitchen has been enhanced with modern stainless steel appliances, and if you love to cook with gas, the gas range stove is waiting for you. There is generous living space including a living room that opens to a wonderful dining area, plus a large bonus room that can be used as a den, play room or office. As you walk outside you have a completely fenced backyard as well as a patio area made for grilling and relaxing with friends. This block constructed home features an updated roof (2013), newer AC (2017), tankless water heater and a large utility room. You are just two blocks away from the Davis Islands trail, perfect for biking, walking or a light jog to Seaplain Basin. The Davis Islands community has all the amenities you could desire including Marjory Park Boat Marina, Sandra Freedman Tennis Complex, Tampa General Hospital, Historic Roy Jenkins pool, Peter O Knight airport, public boat ramp, dog parks more. You are also conveniently located to downtown Tampa, Channelside District and Hyde Park. Additionally, this home is in the Gorrie Elementary, Wilson Middle School and Plant High School boundaries.